Here's the deal: we have a $10,000, 2400-watt, state-of-the-art factory remagnetizing machine in our shop that can magnetize both four-pole and six-pole flywheels. There are maybe 6 people in the entire world that even have access to this machine, but the best part is that we actually know how to use it. I'm not sure we should be telling you this, but whatever; the secret's out now. In short, if you've got a flywheel with weak magnets, send it to us and we'll have one of the technicians in the lab get it ripping your keys out of your pocket in no time. Please see below for details on requesting this service. PS. That's a 19mm wrench in the photograph on the left! Please call or email for details on requesting this service. **NOTES** We can do many different brands and styles of flywheels. -We can remagentize 2, 4, and 6 pole flywheels. -External flywheels from 92-130 mm (3.6-5.11 inches). 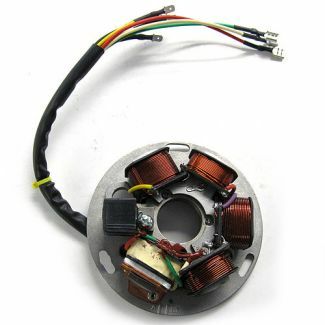 -Internal flywheels from 63-100 mm (2.48-3.94 inches). -Please, Please, Please email us a photo with dimensions of any random flywheel you might have and we'll let you know if we can take care of your needs.